As a recent graduate, I have been thinking a lot about my future in the field of art conservation. Any career in the arts and museums is tough, but it is particularly difficult when the general public does not know that your field exists. I love telling people about conservation because they are usually so fascinated by it and want to learn more. In my experience, there is a genuine interest in the field and people seem to understand the importance of conservation (once they know what it is!). It has been particularly intriguing to see how conservation is covered in the news. A month ago, the New York Times wrote an article about a conservator at Brown University who found a piece of paper signed by Paul Revere. This article, though creating a romanticized notion of conservation, nonetheless brought attention to the field. (If you’re interested, the UIUC Rare Book and Manuscript Director wrote a response to this article.) The New York Times has also recently published two conservation-related articles on its front page (see here and here), as well as the Wall Street Journal (see here and here). This brings me to the most recent scandal from the art world: the vandalism of the Picasso in the Menil Collection in Houston. 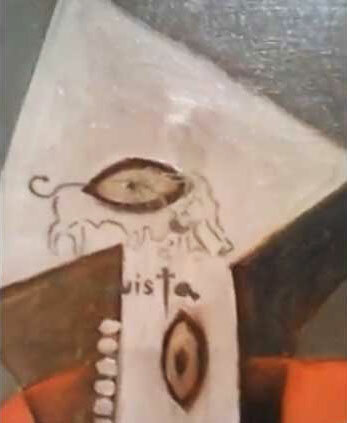 A museum patron catches a man defacing a Picasso, using a stencil to spray-paint an image of a bull and the word “Conquista”. There were two particularly appalling things about this video: the suspect claims to be doing this to “honor Picasso’s work” and the “stunned” man who filmed this thought it was “pretty cool” that someone vandalized a painting. I don’t think Picasso would feel honored, nor would he think it was cool. What I did like, though, was that the museum was able to take the painting down the hall to the conservation department so that it could immediately be treated. I am not in favor of defacing works of art to draw attention to our work, but I think it is important for conservators to take this opportunity and show the public exactly what we do. Luckily, since the painting was immediately taken to the lab, spray paint removal should not be too difficult. The first thing to do would be test the spray paint and determine the chemical composition. Then the conservator can decide which solvents would best remove the chemicals. The spray paint has not had time to sit and become ingrained into the paint layer, and I’m sure the conservator has seen much worse! I feel like I see conservation in the media more and more (I recently saw a crime show where the perpetrators stole an obscene number of van Gogh’s from an art conservation firm and stored them in horrible, non-archival tubing. I could just see the paint flaking off!). While it’s very encouraging to see conservation in the media, it is not enough to simply be mentioned now and again. I think the theme of the latest AIC conference, outreach, speaks to that. Every conservator I have met is extremely passionate about their work, and I know that as we continue to educate the public about the importance of our work, the public will begin to share our passion for–and our insistence on the importance of–conservation.